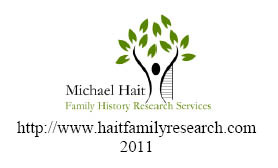 "I Need Help With My Family History! Where Should I Turn?" For those people who until recently have hired genealogists through Ancestry's Expert Connect program, here's some advice on where you can turn for help. I'm going to assume that you're already using message boards such as those found on Ancestry.com. I'm also going to assume that you know about the helpful Roots mailing list. My first suggestion to folks who need help would be to attend a meeting of your local genealogical society. Search the web for the name of your city, county or state plus the word genealogy. That should turn up something fairly close to your area. Genealogy societies are great because they will be there to support you over time. The members vary in their ability and years of experience but they are very willing to share their knowledge. They would be happy to watch and help you grow as a genealogist. If you need a specific lookup you can check a site called Random Acts of Genealogical Kindess (RAOGK). This site provides one-on-one volunteer assistance. Search for the geographic area where the item you need is located. Then select the volunteer who will most likely be able to help you with your request. Send them an email and you're off and running. The abilities of the various volunteers may vary greatly. Genlighten is a website that connects genealogists with on-location researchers who can lookup offline (not yet digitized) documents for you. The researchers provide a profile where you can learn about their experience and expertise. Genealogists pay a fee per lookup. APG is the worldwide membership organization of professional genealogists. APG has more than 2,400 members. Members are required to adhere to the APG Code of Ethics. APG also provides mediation when clients have a complaint about researchers. Each member has a profile online where they list their specialties and expertise. You can search for professionals by location, specialty or name. These researchers can take on much larger and more complicated projects than just lookups. When you have a complicated problem these researchers will be able to help you. Expect to negotiate an hourly rate for their services. BCG is a nationally and internationally recognized organization of credentialed genealogists. It is a certifying body for genealogists not a membership society. Genealogists who achieve Certified Genealogist credentials have passed a rigorous critique of their abilities. BCG offers an online pamphlet entitled, "Why Hire a Board Certified Genealogist." You can search for certified genealogists on the BCG website by name, location or specialty. You can also expect to negotiate an hourly rate for their services. ICAPGEN is the International Commission for the Accreditation of Professional Genealogists. It's rigorous accreditation standards are similar to those of BCG. These experts also can take on more complicated projects. To find an Accredited Genealogist search their online database. One of these options will be sure to help you resolve your family history problem. If you need more information please read the individual websites carefully. You can ask questions here about these options as well. I may or may not have the answer for you but I'll try to find it. 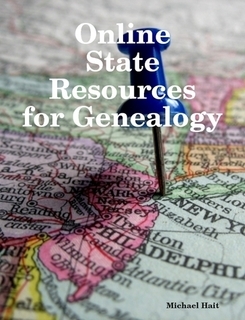 The recently published Online State Resources for Genealogy by Michael Hait is an electronic book in Adobe Acrobat (pdf) format. It is the latest book from this prolific author. In his 310 page book, Hait attempts to help researchers cut through the sheer volume of United States records that are available on the internet. He looks at records that are freely available from government agencies as well as towns, counties and states. In focusing on the lesser known sources, he intentionally excludes from his book large sites such as Ancestry, Footnote, FamilySearch and Find-A-Grave. I decided to put the book through its paces by starting with the state I know best from a research point of view - Massachusetts. Right from the start, I found he included a resource that I had not used before - Digital Commonwealth. Digital Commonwealth features links to collections of resources held by Massachusetts libraries, museums, historical societies, and archives. While it looks like a collection that is still growing, it is definitely a resource to keep an eye for future reference. Hait's treatment of the Massachusetts State Archives provides a comprehensive look at its major holdings. He does not provide information on all of their collections but rather encourages readers to delve deeper into the online site to discover other resources on their own. Given the incredible volume of resources at this repository I think that is probably the best approach. He takes the same approach with all the repositories in his book. Many researchers are perhaps not familiar with the incredible resources available at the often-overlooked Massachusetts Historical Society. An overview is provided for their many online collections including Anti-slavery Images, African Americans and the End of Slavery in Massachusetts, the Siege of Boston and Massachusetts Maps. This is just a sampling of the collections he features. A similar treatment is given for the major repositories of the other sates. 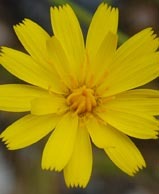 Whenever possible he provides direct links to online collections. Certain states, such as New York, contain reference to important non-governmental collections like the online resources of the Italian Genealogical Group. Larger states also include pointers to important county-level collections. Every state seems well represented by major online collections. Admittedly, some states have better coverage than others. Hopefully this will be corrected in the second edition which is complimentary to first edition purchasers. Researchers who are delving into states that are unfamiliar territory will find this book a helpful introduction. Seasoned specialists will also find this book a handy reference to remind them of the tremendous collections available on the internet. Researchers should remember, however, that not all genealogical records are available on the internet and should make a point of contacting repositories to learn of non-digitized collections as well. From a design point of view, the book is well laid out and easy to read. The Table of Contents provides internal links to sections on the major state repositories. The individual chapters provide links to the websites themselves. The links to the websites opened easily in my default web browser. I didn't encounter any errors or broken links. The index at the back of the book provides a way to search by record type if you prefer to do that. Recognizing that the internet is constantly changing, Hait promises to continually update the book. In this first edition, he has grappled with the monumental task of organizing online state records. In an age that is heading more towards reading books digitally, I'm sure this work will become a genealogical standard. For such a comprehensive book the cost is priced reasonably at $15. I look forward to seeing this book grow and expand in coming years. The author is offering all first edition purchasers a complimentary updated edition when it is released. The book is available for download from lulu.com. Online State Resources for Genealogy. By Michael Hait. Self-published on lulu.com. 310 pp. Index. Electronic Book (Adobe Acrobat format). $15.00. Post Script: This book is best used as a reference for multiple states. If you are primarily interested in one state then your money would probably be better spent buying a book specifically on that state. This doesn't have to do with genealogy or history specifically but I thought it was interesting enough to share anyway. I just read a blog post called "Manage Customer Experience Through Small Details" by Shep Hyken on The Social Customer website/blog. The post is short and worth reading. It discusses the process of checking into two different hotels and how those experiences were vastly different based on little details. When you think of it, it's not really about customers at all. It's about co-workers, friends, cousins, spouses, children and even the stranger passing you on the street. It's all about respect. It warrants a blog post because it seems that respect is in short supply these days. So read the post and then consider applying the concept of "the little details" not just to your customers but to everyone in your life. Then watch how the world changes around you. What Kind of Marketing Should Genealogists Do? In response to my last post "What's a Professional Researcher to Do without Expert Connect? ", Stephanie Hoover wrote a very thought provoking comment.You know I like those kinds the best! You can use the link above to see her full comment. She addressed two important issues that impact genealogists - Marketing and Building a Successful Business. I'm going to address Marketing here and Buildling a Successful Business later. Do you think marketing is important to genealogists who are building their business? If so, what kind of marketing do you do yourself? What activities do you see as marketing? Did I leave anything out? What do you think is important and what's not? I look forward to hearing your responses and I'll share my own thoughts and opinions later. What's a Professional Researcher to Do without Expert Connect? Today Ancestry.com announced that it will be discontinuing its Expert Connect service. This is likely in response to their recent acquisition of the firm, ProGenealogists. A number of my friends who are just getting started as professional genealogists are lamenting the demise of Expert Connect. They felt it was a great way to connect with clients and get client experience. So what's a genealogist to do without Expert Connect? Unlike academic and methodology-focused courses such as Boston University's Genealogical Research Program, the peer-managed ProGen Study Group covers marketing, creating a mission statement and other business-related topics. The benefit of this program is that you won't be on your own. Your assigned peer group with be supporting you and giving you feedback. The skills you learn here will take you far in your business. And the connections with your new peers may connect you to future clients. The Association of Professional Genealogists Quarterly (APGQ) is the only publication (that I know of) that is focused on the business aspects of being a genealogist. Each APGQ if full of advice and suggestions on how to improve your business skills. The publication alone is worth the cost of membership. After you join, sign up for the private APG email list. This is a place for members to meet, network and learn from each other. When I first started in my business I was quite active in participating on the APG list. Most, if not all, of my first clients were peers from this list. Working for my peers taught me not only how to work with clients, but to produce work for clients with high professional expectations. Some researchers prefer to hide behind the books and computer databases. The truth is, if you expect to run a business providing your research skills then you are going to need to learn to communicate well with people. The more face to face meetings you have with other genealogists the more your business will grow. Develop relationships with other genealogists, build a support network of people in your region who you can meet with regularly. Alternatively you can connect with others virtually nationwide who share your niche. Conferences are great places to meet other professional genealogists. You will find both national conferences such as NGS and FGS, as well as regional ones such as NERGC. Another great place to network is at chapter meetings of APG. I belong to the New England Chapter of APG. I make it my number one priority to get to meetings so that I can develop relationships with my New England colleagues. Don't have a chapter near you? Try to find a local genealogical society. Give freely of your time and expertise and you may find yourself on the road to gaining new clients and a good reputation. You'll notice the main themes of the points above are business skills, business skills, business skills and networking, networking, networking. It's not enough to put your name on a list and wait for clients to come knocking on your door. You need to get out and start knocking on metaphorical doors so that clients will learn that you exist. Ancestry's Expert Connect service may be ending but there are lots of great alternatives if you put your mind to it. Remember, when a door closes, another one opens. I once had a manager who told me, "If you fail to plan, you plan to fail." Start planning how you are going to succeed. Recently, Amy Coffin of the We Tree Genealogy Blog wrote an important post about blogging and how easy (or not) bloggers make it to leave comments. She pondered whether bloggers unintentionally make it more difficult than necessary for their audience to comment on blogs. She asked other bloggers to answer a series of questions about their practices. It was clear that many of the bloggers hadn't given much thought to it previously and many changed their settings based on Amy's discussion. This post really got me thinking about blogging and technology. First off, I was reading the blog post on my smart phone. I enjoy reading it that way because it has a really nice interface. It shows me only the blog post itself and cuts out the distracting navigation menu and extraneous stuff on the side of my Google Reader. However, it makes if really difficult to leave comments. You take the challenge that exists normally on a blog and then double it when using a smart phone. I just wonder how many comments blog authors lose because of issues like this. After realizing that, I started wondering why, with so many millions of bloggers in the world blogging on endless different topics, that software developers don't do more to make blogging better. It makes me think that the developers aren't bloggers themselves or else they would change a few things. Here's my wish list for a few things that I would change. I'll only mention a couple things here but the list could go on and on. These are directed at Blogger.com since that is the program that I use. 1) Make the interface for comments easier to use for readers who are not techies. What are all those options anyway? I don't even know what some of them mean. For someone who is not tech savvy it's downright scary. If anonymous posts are allowed, feature that clearly and simply at the top and put all the other techy options beneath that. Stop scaring our readers away! 2) Make "Open Link In New Window" a menu option when adding links. It's so simple it should be obvious but clearly it's not. Please stop driving our readers away to other sites or helping them get lost when they can't find their way back. 3) Put more effort into the interface for smart phones. Make it easy for smart phone users to leave comments. More and more people are using smart phones. Reading blogs is a great thing to do when you are sitting in the doctor's office or at the soccer field waiting for a practice to end. More people would read blogs and comment on them if you focused on this up-and-coming technology. Give Us An EASY BUTTON! Blogger developers, please give us an easy button! The technology is there to make the interfaces easier to use while providing more advanced options at the same time. Perhaps you need to create some focus groups so you can find out directly what we want. Ask us how we use the programs. We'll be happy to tell you. Bloggers - tell me what's on your wish list! I started to get very active in genealogy and the genealogical community in 2006. I was actively following the APG (Association of Professional Genealogists) list and absorbing everything from uber genealogists such as Elizabeth Shown Mills. It must have been on that list that I learned about the New England Regional Genealogical Conference (NERGC). While I was actively engaged in writing on the APG list I still wasn't coming face to face with other genealogists. In February 2007 I attended my first APG meeting. There I met Melinde Lutz Sanborn who ran the meeting and Polly Kimmitt, who was also a first time attendee. Between the APG list and the APG meeting I really felt that I needed to attend NERGC so that I could, first and foremost, learn from the sessions and secondly to meet other genealogists. The conference in April 2007 was held in Hartford, CT which was a big help. I had grown up near Hartford and my Dad still lived in a nearby town. I could stay with him, save some money and have my big adventure. I was nervous because I didn't know anyone except the few people that I had briefly met at the APG meeting a few months earlier. But my desire to attend was greater than my fear of not knowing anyone. There were some great highlights of the conference for me. The best perhaps was attending the sessions and speaking with Hank Z. Jones, the Palatine expert. I have a Palatine ancestor and had spent hours intimately pouring over his books. He was a wonderful speaker and very accommodating when I approached him. Another highlight was hearing Sandy Clunies. She was a terrific speaker, entertaining, engaging and knowledgeable. I also went to see a talk by Diane Rapaport who spoke about her book The Naked Quaker. I was captivated by that talk as well. I think I went to every talk by Megan Smolenyak and Colleen Fitzpatrick. I approached Megan in the Exhibitor's Hall and spoke with her briefly. I was petrified at the time. But I really wanted to tell her about this crazy research idea about the Edwards family owning Manhattan. I'm not so scared to talk to Megan now but I am still trying to sell her on the Edwards family! I remember seeing Melinde Sanborn in the Exhibitor hall as well. I caught her at a moment when she wasn't talking with anyone else. I don't remember what we talked about. I just remember wanting to meet her again and let her know how interested I was in genealogy and how happy I was that I attended the APG meeting. Melinde has this incredible way of engaging people in conversation, identifying their potential and then forcing them, with the softest words, to be their absolute best. Not all at that one moment of course, but over time. I remember she made me feel so welcome. During the course of the conference I randomly passed a man in the hallway named George Silver. I stopped him and asked him if he was one of the Silvers from Kincardine, Scotland. We compared notes and indeed he was. I had found my first cousin. Besides being a distant cousin, George happens to be one of the most delightful people you could talk to. I was so happy to see him again at NERGC 2009 and fully expect to see him in 2011 as well. By the end of NERGC 2007 I found myself wandering over to Melinde and offering to volunteer to help with NERGC 2009. Yes, I admit, after my first conference experience I wanted to get involved. Did NERGC 2007 change my life? Absolutely! It may not change yours quite as much as it changed mine but I'm sure you will have no regrets if you decide to make this your first experience at a genealogy conference. "For many years all newly-married men were elected "Hog Reives" at the annual April meeting." This item was dated 1800. Now this makes for a very interesting marriage record substitute! If you had an early Medway ancestor whose marriage date you did not know, you could possibly surmise the date within a year if you discovered that they had been elected a Hog Reave. Of course, one of the challenges with this is that there are no parameters with which to frame the tradition. The text doesn't say when the practice started or ended. There may, however, be more information about that in the Medway Town Record Books. Also, one would think that if a gentleman was elected a Hog Reave that his marriage had been recorded in the town record book. You would think the marriage record was one of the factors in getting him appointed. However, genealogy being the quirky discipline that it is, you may just find this works as a marriage substitute in some cases. I wonder if this was a common tradition in other Massachusetts towns. Let me know if you have come across traditions like this for newlyweds in your research. Source: Orion, T. Mason, The Handbook of Medway History, 1713-1913. (Medway: G.M. Billings, Printer, 1913), 27. Recently I wrote an article entitled "The #1 Thing That Impacted My Research in 2010" where I discussed an epiphany I had about using footnotes as a guide to help with my research. Martin said... "I've been doing that for 20 years; talking about it for 20 years; writing about it for 20 years; and blogging about it for 3 years. Maybe people will listen to you, but I doubt it." Martin's comment really got me thinking about genealogy, blogging, education and skills. The reality is that genealogical skills and educational training vary greatly among genealogists. I hate to use a sports analogy but I'm going to anyway. In the game of golf there are hobbyists and professionals and many layers in between. The skill level and training of a hobbyist golfer, amateur golfer and professional golfer vary widely. Similarly, genealogists have the same variance in their training and skill level when it comes to researching their ancestors. Some genealogists never get past the superficial momentary fad of quickly checking for their ancestors online. Others go a bit farther, seeking out ways to increase their success in the quest for their ancestors. Others become smitten with genealogy, and even if they don't choose to become professional, they explore ever opportunity to improve their skills. And for those with the strongest interest there are many institutions, seminars, conferences, journals etc that help them to achieve their goals. Besides the desire to seek out further education, another aspect that impacts genealogical skill is pace. Even though we may all seek to better educate ourselves we can't all do it at the same rate. A single person or a retired person may have more resources and time on their hands than a middle-aged genealogist with a full time job or three kids to watch over. Contrast the outside pressures in our lives with the impetus that is pushing us to learn and that creates an environment where some learn quicker than others even if the desire is great. In my own case, for example, I have many distractions, I mean responsibilities, in my life. That means that while I would like to focus on improving my genealogical education and skills to the fullest, I don't always get to do that. Jump starting my education by attending far away institutions is not really an option for me. So I make headway as best I can on my own, by reading journals, following blogs and collaborating with colleagues who have greater expertise. So to answer your unspoken question, Martin - What's the point of wasting time blogging and trying to educate people? I think that can only be answered individually. I'm a populist at heart. For me that means blogging about ideas that will help people is a worthwhile effort even on the chance that nobody reads it or learns from it. 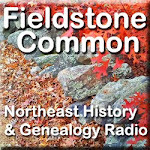 I admit that I am hesitant to share the shortcomings in my own genealogical education. I'm afraid to show that I don't know something which I should probably already know. But once I started blogging I thought it might help other people if I blog about what I'm learning along the way. If it helps bring other genealogists further along in their skill level then it was worth admitting I'm not perfect. Martin, I hope you'll keep writing and blogging so that I can continue to learn and come closer to attaining the same level of ability that you have. At least you will know that one person is listening. If you're anything like me you've been scratching your head for the last week or two and wondering where your List News Feeds have gone. Today I've discovered the answer and I'd like to share it with those who are still scratching their heads. 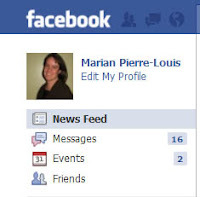 Lists are a tool in Facebook that allow you to sort and categorize your friends. You may notice that when you "friend" someone, Facebook asks if you would like to add them to a list. To see what lists you have, go to Account, then choose Edit Friends. Your lists will appear on the left side of the screen and a "+Create a List" button appears at the top center of your screen. By hovering over each of your friends you can edit the lists they belong to. There are a bunch of different uses for lists which I'm not going to go into here. 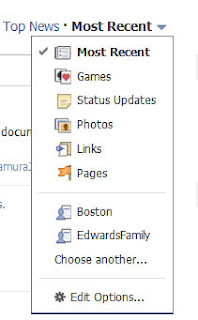 But if you have a lot of Facebook friends like I do, then lists can be used to see News Feeds from specific people. For instance, say you want to see News Feeds / Status Updates from just your family. 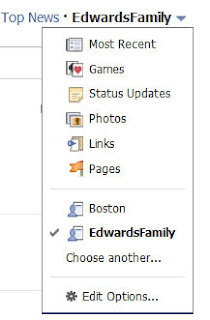 You can create a list called "family" and that will allow you to see just their status updates. A little while ago you used to see "List Feeds" by clicking on the Friends link on the left hand side of your screen. I've been hunting for them there lately only to discover that none of my lists appear when I click on the Friends link. So where have the List Feeds gone? Now, to access these same List feeds find the Tops News / Most Recent links in the top center of your News Feed page. To the right of Most Recent you will see a little arrow. Click on the arrow. After clicking on the arrow you will see a list with other main menu options. Then there will be a divider line and beneath that your list feeds. In my case you can see a list for Boston (these are all my Boston friends) and for EdwardsFamily. 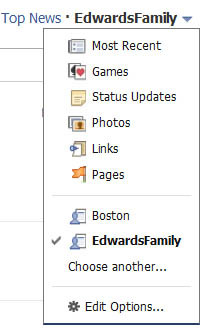 When I want to see Status Updates from just my family I click on the EdwardsFamily link. Now on my News Feed page all other Status Updates will disappear and I will only see those from my family. This is a great way to make sure you don't miss any updates from your family members. To view the Status Updates from all of your friends again, click the same arrow at the top of the page and select Most Recent. I hope you find this helpful. I'm just happy that I won't miss any important Status Updates anymore. Genealogists are some of the most understanding and prepared people when it comes to death. Yet don't let that fool you. They do not go willingly in that direction. They are the least accepting of it because there is always more research to do. "Reflecting on the past year, what was the number one thing that impacted your genealogical research? Was it a family discovery, a class taken, a lecture attended, a new distant cousin or something else?" I got some really interesting answers from my friends. Now it's time for me to add my own answer. This may seem very simple to the rest of you but it was quite profound for me. It was all about footnotes. I love footnotes for the way they can reveal and point you to sources you didn't know about before. I have been reading peer-reviewed journals such at the National Genealogical Society Quarterly (NGSQ), the New York Genealogical and Biographical Record and the New England Historical & Genealogical Register for quite some time. I read the NGSQ cover to cover, with great interest but not purposefully. This year instead of reading articles that were merely presented to me I learned that I can seek out articles that relate specifically to my research interest either geographically or for a given time period. It finally dawned on me that if I am researching Yarmouth, Massachusetts I can seek out other articles on Yarmouth and the footnotes will be specifically helpful to me. I know your saying that is so obvious but it wasn't obvious to me. I've always known to do a PERSI search or a search of the NEHGS catalog or the Family History Library catalog for a specific family but it didn't really occur to me to seek out articles specifically on a location. Or my location based research focused on records and not on published articles. I receive a copy of the Register regularly but I have to admit I have seldom read it in the past. The articles just seemed a bit dry to me. But when I realized that I could seek out the exact footnotes that could help me that all changed. Most of my research, both professional and personal, is focused on New England and New York. And to think that I was ignoring the one journal that could help me the most. Now I check the table of contents for the Register immediately to see if any of it is relevant for my research. I also check back issues online at the NEHGS website. I still don't read it cover to cover but the articles have greater significance for me when I do read it. I guess 2010 was year for location based research! Have you been purposefully looking for peer-reviewed articles that are similar to your research targets? If not, think about where you are researching and what time periods. There are great journals across the United States and Europe that will help you. If you are having trouble finding journals that meet your needs leave me a comment and I'll try to help you find some. 2009-2014 Marian Pierre-Louis. If you would like to use any of the content contact the author. Powered by Blogger.